BIG SALE!! FENG SHUI WEALTH & MONEY CURES BIG SALE!! 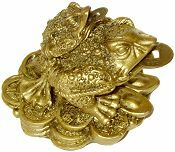 This Mini Prosperity Frog is resting upon a bed of Gold Ingots symbolizing wealth and good fortune. The 3 legged toad or ChanChu is considered to be a powerful wealth energizer, it is best placed near cash registers or in the Wealth Corner which is the far left corner from the entrance of a home or building. ChanChu Wealth Frog on Bagua carries a lucky gold coin in his mouth. 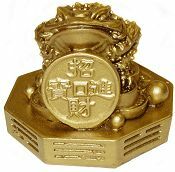 This gold resin Money Frog figurine holds an auspicious Ruyi Scepter for right choice and a happy life atop gold ingots and coins on a lucky Bagua base. Feng Shui Masters recommend that he be placed inside the front door facing the living area to direct wealth and prosperity into your home. Chan Chu, the mythical Chinese money frog is said to be seen at the full moon around homes whose time it is to receive blessings and abundance. This Antique Gold finish solid stone resin Chan Chu figurine sits on ancient Chinese coins and has ruby eyes with a Chinese coin for his mouth. Ancient Chinese Coins with a square in the center have been strung with red cord or ribbon and used as a Feng Shui money cure for centuries. Placing three to eight strung coins in your purse, taped onto your check book or hung from an inside door will attract money and new revenue sources into your household. This set of 10 different lucky Chinese coins is a perfect start to placing them around the home and changing your luck. Double your luck with a big mama and little baby Money Frog figurine! Two Gold Prosperity Frogs each with their own lucky coin to banish bad Feng Shui and bring good luck to your door. They sit atop a treasure mountain of gold coins and gold nuggets. Feng Shui Masters recommend that they be placed inside the front door facing the living area to direct wealth and prosperity into your home. 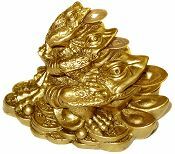 Triple your luck with a family of three Gold Wealth Frogs, each biting on a coin to for good fortune and abundance in Feng Shui Lore. They sit on a treasure pile of gold coins, nuggets and gems. The 3 legged toad is considered to be a powerful wealth energizer, it is best placed near cash registers or in the Wealth Corner which is the far left corner from the entrance of a home or building. In Chinese lore, ChanChu the three-legged frog is thought to drive away evil, protect goods and money, and increase income. He carries a lucky gold coin in his mouth. Feng Shui Masters recommend that he be placed inside the front door facing the living area to direct wealth and prosperity into your home. Hong Tse stone resin sculpture with a highly polished Rosewood finish. This hand painted Gold Wealth Frog figurine sits on a gold ingot treasure trove and has ruby eyes with a separate Chinese lucky coin for his mouth. In Chinese lore, ChanChu the three-legged toad is thought to drive away evil, protect property and money and increase income. He carries a lucky gold coin in his mouth. Polyresin Wealth Frog figurine in high gloss gold plated finish. Hand painted Gold Money Frog on Bagua is shown biting on a lucky coin to signify tremendous good fortune and prosperity in Feng Shui lore. Feng Shui Masters recommend that he be placed inside the front door facing the living area to direct wealth and prosperity into your home. 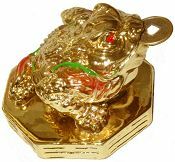 Polyresin Prosperity Frog figurine on Bagua with lucky coin included in high gloss gold plated finish. Unusual extra large Money Frog figurine with red and green jewel crystal accents has 2 sets of removable 5 Lucky Coins tied with red silk tassels which can be hung separately elsewhere. 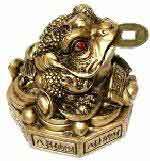 The Wealth frog biting on a coin signifies tremendous good fortune and prosperity in Feng Shui lore. Feng Shui Masters recommend that he be placed inside the front door facing the living area to direct wealth and prosperity into your home. 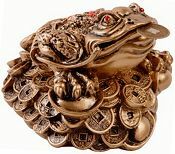 The large faux Jade Money Frog is shown biting on a coin to signify tremendous good fortune and prosperity in Feng Shui. He has the traditional ruby crystal eyes with ruby crystals scattered on his back. This 3 legged toad or ChanChu is atop a mountain of gold coins. Feng Shui Masters recommend that he be placed inside the front door facing the living area to direct wealth and prosperity into your home. 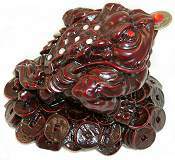 The 5" wide Money Frog with ruby crystal accents is shown biting on a coin to signify tremendous good fortune and prosperity in Feng Shui Lore. This 3 legged toad or ChanChu is atop a mountain of gold coins and ingots. Feng Shui Masters recommend that he be placed inside the front door facing the living area to direct wealth and prosperity into your home. 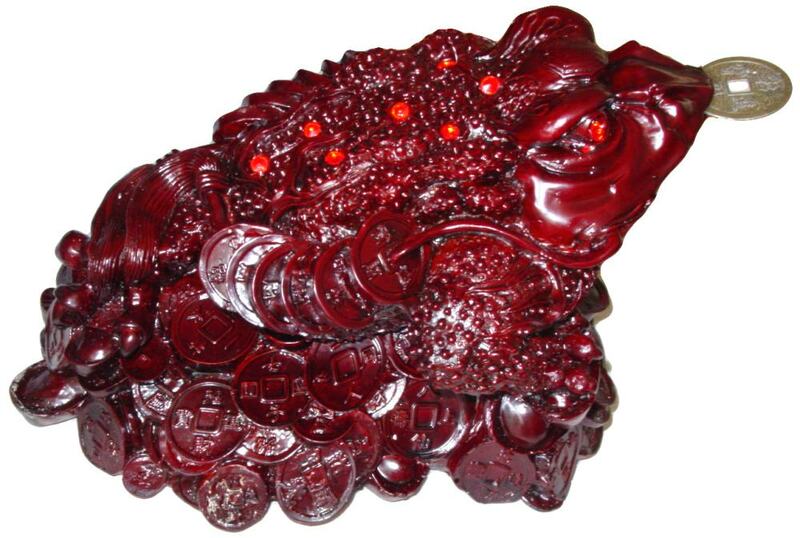 A larger than life huge 13" H Money Frog with red crystal eyes, is not only biting on a brass coin to signify tremendous good fortune and prosperity, he also carries strings of of coins on each side of his back. This classic ChanChu frog sits atop a mountain of gold coins and ingots. Feng Shui Masters recommend that he be placed inside the front door facing the living area to direct wealth and prosperity into your home. 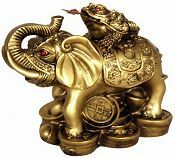 Large Money Frog with ruby crystal eyes and separate lucky coin sits atop a ceremonial elephant on a mountain of gold and treasure. This attractive Feng Shui figurine combines the the good luck and prosperity symbol of the wealth frog with the familial happiness and loyalty of the elephant. 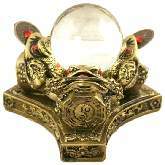 Suitable to place in a family or business area to increase contentment and abundance according to Feng Shui lore. A Gold Money Frog shows off a lucky gold coin too big for his mouth!! He sits atop a mountain of gold coins nuggets and gems on a Feng Shui Bagua base. Place him in your wealth bowl or your prosperity corner (the far left corner from the entrance of a home or building). Gorgeous, Chan Chu Lucky Frog gold plated figurine has colorful hand painted accents. Chan Chu, the mythical Chinese money frog is said to be seen at the full moon around homes whose time it is to receive blessings and abundance. He sits on ancient Chinese coins with a lucky Chinese coin in his mouth atop a faux wood pedestal.